Democrats brought this on themselves. Thirty years after the fateful battle over Robert Bork, the filibuster for Supreme Court nominations is dead. We have now fully transitioned to a new, openly political process for confirming our nation’s highest jurists. And since Democrats started this fight and escalated it at every opportunity, it’s only fair that Republicans got to end it, installing Neil Gorsuch to the Court and clearing the way for future Trump nominees. This original “borking” didn’t require a filibuster because Democrats had a Senate majority and could simply vote the nomination down. But it was only a matter of time before a Senate minority would claim the head of a judicial nominee, and Democrats were once again the culprits. In 2002 they launched the first-ever filibuster of an appeals-court nominee, Miguel Estrada. Republicans didn’t have the stomach to invoke the “nuclear option,” eliminating the filibuster through a simple Senate rule change, so the nomination went down in flames, as did a few other Bush picks. Democrats didn’t push their luck too much, however. Seven moderates agreed in 2005 to approve some nominations they’d initially filibustered in a deal to stave off the nuclear option—and when a few Democrats tried to take out Supreme Court nominee Samuel Alito the next year, they fell well short of the 41 votes needed to prevent a “cloture” vote to end the filibuster effort. No doubt they knew that if they brought this tactic to the nation’s highest court, Republicans would have no choice but to go nuclear. The presidency changed hands in 2009, and Democrats developed a different view of judicial filibusters. In 2013 they were the ones to unleash the nuke, ending filibusters for non-Supreme Court nominations and thus denying Republicans a tool that Democrats themselves had brought online in the first place. They were prepared to drop a second bomb, too. Last year, Tim Kaine—secure in the knowledge that he would be the next vice president and preside over a Democratic Senate—proudly announced that his party would destroy the Supreme Court filibuster when those lawless Republicans inevitably tried to block President Hillary Clinton’s nominees. Republicans aren’t entirely blameless here. They paid the Democrats back in full in the lower courts, filibustering several Obama nominees before the Dems pushed the nuclear button. And last year they simply refused to consider the Supreme Court nomination of Merrick Garland, a petty move even if it was entirely constitutional. But it was Democrats who started this transition—away from adherence to unwritten norms and toward an all’s-fair-in-love-and-war mindset—and repeatedly upped the stakes. It’s hard to feel sorry for them that it’s a Republican president who will serve the first term under the new rules. Once Bork got borked, it was practically inevitable that we would end up here, with no lingering stigma for voting down qualified nominees for political reasons, but also with no filibuster to allow a minority to pull this nonsense. Such behavior can’t last when all it takes is a majority vote to change Senate rules. Should we mourn the end of the filibuster on some level? Well, it’s not dead yet: it’s still allowed for legislation, as opposed to nominations, though that could change as well. But more to the point, if we should mourn the filibuster we should focus our lamentations on a long-dead form of it. As TAC editor Robert W. Merry explained in a Washington Times column last month, there was a time when the maneuver allowed a minority to register its extreme disagreement with the path the majority had chosen, not to obstruct anything it felt like obstructing. Back then, Senate rules required the minority to actually filibuster—they had to hold the Senate floor indefinitely, talking continuously, even if that meant reading a dictionary. This was exhausting and wasted the time of the nation’s legislature, imposing personal and political costs on those who took this route. But the rules changed in 1975. As Merry writes, “Whereas previously any senator who wanted to filibuster had to stand up and make his case, foregoing nourishment and bathroom breaks, now he could just declare his intent to filibuster and go merrily on his way.” Nowadays old-school “talking filibusters” are rare and done mostly for the cameras. Before 1987, various unwritten customs governed how the Senate handled judicial nominations. That year—just one year after confirming Antonin Scalia 98–0—Democrats decided to abandon those norms and instead use all the tools at their disposal to achieve their political goals. They voted down Robert Bork (and smeared him for good measure) when they had a majority, filibustered Miguel Estrada when they didn’t, went nuclear when Republicans turned the tables on them in 2013, and had every intention of forcing Hillary Clinton’s nominees through this year. It is poetic justice that the natural end point of this process, the demise of the filibuster for Supreme Court nominees, could cost them the Court for a generation. Without Republicans voting against him, Bork would’ve been on the Court. But, as a liberal, I’m OK with the death of the filibuster. Hopefully, it’s beginning of the end of the Senate. My guess is that this only applies if one forgets Roosevelt and the Four Horsemen. Roosevelt’s attempt to pack the court was in retaliation to their (political) intransigence. Or I suppose you could argue Jefferson was really a “Democrat” and the then so-called Republican attempt to impeach Samuel Chase would indeed make the Democrats the Original Sinners. Failing to mention the Saturday Night Massacre in the context of Bork’s fitness for the Court is rather curious. This is the most wonderfully self-serving and partisan article I have read in a while. I come to TAC to read an analysis from the right that isnt caught up in this horrible, zero-sum partisanship where every issue is defined by which party you support. Shame, it looks as if my search for a reliable source of information must continue. That’s gone down the Republican memory hole. Let the judicial branch staff the Supreme Court without interference from the executive branch. Double the number of SCOTUS judges. And last year they simply refused to consider the Supreme Court nomination of Merrick Garland, a petty move even if it was entirely constitutional. Petty?! If you minimize all the GOP actions in your chronology, of course you’ll come up with the conclusions that it’s the Dems fault. If it weren’t for Garland, Gorsuch may well have received 60 votes. But Dems, and their base, were still steamed about Garland. Christian conservatives were willing this year to vote for a man who violated, unapologetically, virtually every principle they espouse, to be President of the US. Why? Hillary hatred was strong – but the real reason was the upcoming SCOTUS nomination. Even when close to a majority of Republican voters acknowledged that Trump was unqualified to be President – it was all about the Supreme Court pick that McConnell had reserved for him, if he won the election. Meanwhile, a lot of liberals have sat out recent elections, or voted third party, with the line “the Supreme Court will still protect our liberties”. About time they learned that’s no guarantee. And if the Garland -> Gorsuch machinations don’t prove that to them, no doubt Trump’s next nominee will hit them across the head with a two-by-four. Yawn…Court has political issue my entire life. So what. Petty?!?? They didn’t even give him a hearing! That was HUGE MOVE. Everyone here pointing out the selective partisanship of this article is dead on, but it’s even more foolish to think this is somehow the natural “end point” of SCOTUS politicization. Blue slips will absolutely be the next thing to go. Count on it. And I also have zero doubt that the Garland Rule (or Biden Rule or whatever you want to call it) will soon spill the banks of electoral years and be used to any nominee made by a president of the opposite party. How could it not? What incentive do Senators have to hold back at this point? What principled argument will Republicans make to Democrats when Thomas retires and Schumer is majority leader? Please, we all know where this is going. The problems for the Republican party started of course in the 1980s with the rising of the religious right, and along with it the negation of compassion for immigrants, the poor etc, the denial of science. Riding shotgun was the sad turn to place faith over reality, belief over science, paranoia over understanding and sympathy. Now, many years later we are seeing the backward stepchildren of that culturally heritage, of reactionist, negationist political policy that aims to obliterate anything that smells of common sense or science. The Right has morphed into a bizarro superman incarnate. Hello? I guess it was constitutional, if you consider the Senate’s Advise and Consent role in the process to be optional depending on whether or not the Senate Majority leader likes the current president. However, I just went through the Constitution in detail, and no where does it say that the Senate can decide which President they can Advise and Consent for, so this is just another of those precedents that have been created for the sake of politics that will contribute to the further dis-functioning of our constitutional republic. Enough with the squabbling over who rides on the white horse: if the left wants to pick the judges, let it win the elections. More than enough water has passed under the bridge that nobody wants to listen to outs whining about the pity of it all. And please, no faux expressions of concern for the opposition that what goes around will come around. The point of the article is that its come back around so many times in the past 50 years that everyone knows how the game is played and that the left is at least as responsible as the right for whatever rules, or lack of rules, are in force. Will the Right please get over Bork? He was rejected by an up-down vote– no funny parliamentary maneuvers were involved. Moreover there GOP senators who voted against Bork too– it was not simply a matter of partisanship. Science has little, if anything to do this. Moreover, Reagan signed what would be considered pretty liberal immigration legislation in 1986. The problem really began when the Democrats claimed that the murder of unborn children was a civil right to be protected at all cost. Democrats such as Ted Kennedy brought down Bork’s nomination in order to defend Roe. v. Wade. Not only are we still reaping the horrific consequences of Roe v. Wade today, both morally and in terms of the damage it did to our constitutional order, but the Democrats defense of it beginning with Bork made Supreme Court nominations increasingly political. It’s only fitting that they have paid a price with the failed Garland nomination, the election of Trump and now the successful Gorsuch nomination. Hopefully another Supreme Court justice will step down this summer as rumored and they’ll pay again. Regardless of the talking head Dem-Repub blame game, we still get the endless wars of both, the mass surveillance of both, the supine service to Wall Street of both. The Constitution has nothing to say about how big the Supreme Court should be. I believe any Democratic President should increase the Court by how ever many seats were stolen by Trump’s election. The Republicans are undoubtedly equally to blame. Two wrongs don’t make a right, and with every wrong by the Democrats the Republicans have matched or one-upped them. There’s nothing in your description of Republican actions above to demonstrate moderation or an attempt to keep the moral high ground. The disfunction in the senate is very much the product of a bipartisan effort! Roosevelt conceived his court packing plan in response to decisions by the U.S. Supreme Court, including Democrats Brandeis, McReynolds, and Cardozo, not Republicans, who held fewer than twenty-five votes, in the Senate. Those of us who lived through it remember it very well. Bork was acting Attorney General after his two predecessors resigned or were fired rather than dismiss the Watergate Special Prosecutor. Everyone at the time, Democrat and Republican, agreed Bork did what was necessary for the bloodletting to end. It was up to Congress, not the Justice Department or the Courts, to resolve the question of Richard Nixon. No one held Bork’s action against him then or when he was nominated, either to the Court of Appeals or the Supreme Court. “And last year they simply refused to consider the Supreme Court nomination of Merrick Garland, a petty move even if it was entirely constitutional. Putting Garland through Senate hearings, grilling him as they did Judge Gorsuch, when they were not going to put his confirmation to a vote, would have been petty. Republicans told Obama they were not going to consider his nomination, pending the November election, even before he submitted Judge Garland’s name. President Obama alone was responsible for creating this “crisis” and embarrassment. I remember those Senators well – John Warner and Arlen Specter – the men for whom the term RINO was coined. Specter even would eventually switch parties formally in order to seek reelection. No, the opposition to Bork was totally partisan, based solely upon the naysayers commitment to furthering the influence of their ideology upon the American judicial system. It remains their objective today. Enough with the squabbling over who rides on the white horse: if the left wants to pick the judges, let it win the elections. Well they did, but then the senate decided that wasn’t good enough. I swear this Garland thing is going to come back to bite Republicans hard, maybe when Ginsberg retires in jan 2020. I can’t wait to watch them squirm then. Amen to that. We fight each other to death over social issues, and Wall Street giggles into its soup at how easily we are all being played. Shall we fly to Aspen this weekend? Will the Right please get over Bork? He was rejected by an up-down vote– no funny parliamentary maneuvers were involved. He was rejected only after an unprecedented, massively funded campaign of character assassination, which horrifically distorted his judicial, DOJ and academic records (they even went digging through his video rental records and old leases). It was the Bork nomination that created the advent of thoroughly politicized Supreme Court nominations. How extreme was he? So extreme he was unanimously confirmed to the DC Court of Appeals. So extreme that he had precisely the same voting record as fellow DC Circuit judge Antonin Scalia save in two cases (in both of which he actually came out more pro-First Amendment than Scalia) – the same Scalia who, the year before, was confirmed 98-0 to the Supreme Court. So extreme that he was endorsed in person at Bork’s hearing by Chief Justice Warren Burger. Will I get over Bork? No, I won’t. And it’s not just because of what was done to a good man and supremely qualified judge, but because it revealed just how ruthlessly dedicated the activist Left is to forcing their political agenda on the nation through the ukase of the courts – no matter the price. Democrats had taken back control of the US Senate in the 1986 midterms, giving them a 55-45 majority. It would not have mattered if every single Republican had voted for Bork – he still would have lost. Democrats actually raised that briefly at Bork’s hearings, but it was quickly obvious there wasn’t anything they could really do with it. Richardson and Ruckelshaus had both personally promised the Senate at the confirmation that they would not fire Cox. Bork, the next in line, had not, and initially intended to resign anyway – but Richardson and Ruckelshaus prevailed on him to execute Nixon’s order rather than allow the Department of Justice to be gutted by one resignation after another for what was, after all, technically a valid, legal order by the president. Not really, when so many conservatives feel the need generate moral equivalency for their deplorable actions. Bork was u-n-q-u-a-l-i-f-i-e-d. If having a fancy law degree and doing a lot in government was all that mattered, President Clinton would be confirming Merrick garland right now. And a less nakedly craven batch of conservatives would understand this. Yes, SOME of the arguments against Bork were uncessesary, but he was clearly outside of the norm of the Court. He openly stated desires to overturn not just settled law (Which Gorsuch didn’t do BTW) but even the settled princples, behind settled law. the “norm”, since that is what we are all supposed to care about, is not to do that. And as for the nonsense many leaders (like Biden) refused to do it, and Republicans also voted agianst him (which is the real reason he lost. Democrats have attempted to shut down a couple of extreme outliers and have voted for conservatives within the norms of the Senate before and after each time. They instituted the filibuster after the republicansblocked mainstreme judges multiple times at once, literally blocking the governemnt from functioning rather than let Obama do anything. At least with Gorsuch Democrats made arguments why they opposed him, with Garland it was they just didn’t want Obama to nominate anyone. And they brag about all this! The funny thing is that I can easily see scenarios in which this leads to a further left court than it would otherwise if they had let Obama pick Garland. An object observer can see the court is more conservative than both the court historically and vs. the country (which btw I don’t consider an all bad thing in principle). It’s because Democrats nominate moderates like Kagan, Sotomayor, and Garland. There is likely a limit to how conservative a GOP judge might be that’s not too far from the ones there now because at a certain point they wouldn’t be an originalist at least some Republicans would vote against them. In a court that is already weighted right, when neither the base nor the party particularly cares about originalism, against a party that is so hostile that members openly state desires to shred up the government instead of compromise, what incentive would Democrats have to pack the court with as far left judges as their majorities might vote for? For that matter, is there anything stopping future Congresses from simply adding more than 9 judges to break Judicial majorites? Conservatives didn’t seem to think there was a problem when it was only 8…sigh, where does this end? Uh, if it Garland had been confirmed, then there would be no Gorsuch nomination…at least not at this moment. So much for the intelligence of our DC ‘Wonk’ class. One of the reasons Trump won is because he fights. Imagine, after Ted Kennedy’s diatribe against Bork, if the Republicans in unison had said, “At least Bork hasn’t killed anyone.” One mistake Reagan and the Repubs made was not fighting back, hard and instantaneously. There IS another step beyond this: packing the Court. Let’s say the Democrats have control of the White House and both houses of Congress in 6 years, as may indeed happen. That would give them all the legal authority necessary to increase the number of seats on the Supreme Court — say, from 9 to 15 — and pack it with committed liberals. This would tip the balance so far that Republicans, should they ever regain control, would have few alternatives but to pack it in the other direction — for instance, by increasing the number of seats to 23. By this point, of course, the Supreme Court would be an open joke, and so would be our whole form of government, but this is what happens when politicians reject the ideas that there are truths that constrain them that they cannot change and that their are customs that constrain them that they must not change. This much violence to our system of government would bring it down, but there is no longer any reason to think it won’t happen. “A petty move”, referring to the Republicans’ refusal to consider Merrick Garland? First of all, they were following the “Biden rule”, the former Senator’s promise to do the same to a potential pick by a lame duck Republican President. But calling it “petty” makes it seem as if this was analogous to a pouty kid taking his football and going home after his team lost at the neighborhood park. Another way to look at it is that principled – or pressured – GOP politicians decided not to allow Justice Scalia to be replaced by a left-wing ideologue who would continue the work of destroying religious liberty. It was the Dems that won in the longer term on this. 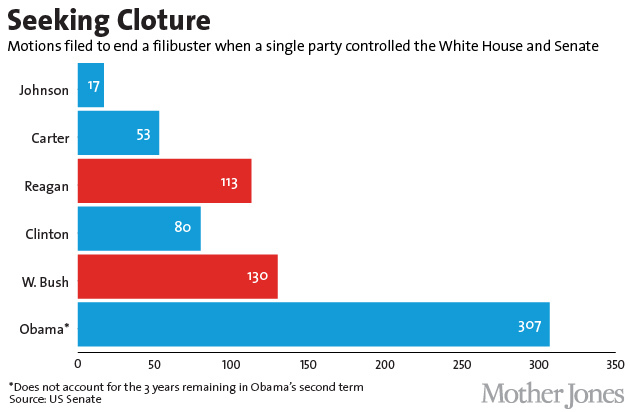 The filibuster has served the GOP much more in recent decades than the Dems. That’s why the GOP tried to talk the Dems out of this. You would do better to say “ideological” rather than “partisan”. But opposition to a potential justice on ideological grounds when the justice holds extremist views (yes, Bork did!) is completely appropriate. If senators on the Right turned down a Democratic nominee whose views held (as an example) that the Constitution required (not just permitted, but required) universal healthcare that would be quite fitting too. Indeed, I see no problem with the Right voting against a Democratic nominee because they disagree with the nominee on Roe vs Wade or Oberfell. I suspect you would not either. Why is it only an outrage when Democrats (or in the past before the species went extinct) liberal Republicans do it? This is a gross misrepresentation of the facts– AKA, a barefaced lie. Bork’s character was not impugned in the slightest with the sole exception of the Democrats bringing up his role in Watergate– but that’s not “Character assassination” since the facts of his actions were not in dispute: Bork did what he was said to have done in 1973. If you are talking about a bit of hyperbole over his views– well, that’s normal politics, exaggerated rhetoric on such things has been part of our politics since Washington was president (when George Washington– yes, even him!– was named a coward and a traitor for signing the Jay Treaty with Great Britain). “If you can’t stand the heat get out of the kitchen” for crying out loud. But in fact Bork really did hold a non-exaggerated version of the views attributed to him. He gave us “Slouching Toward Gomorrah” as evidence, and other tidbits as well. Any judge who states that the Ninth Amendment is a mere “inkblot” with the implication that it is meaningless had no business on any court. The Right complains all the time about liberal justices reading things into the Constitution that are not there. Fair enough. But how about publicly stating one intends to ignore something that very explicitly is there? I cannot imagine anything else, short of actual criminal behavior, that would disqualify a judge more than than that! Re: Will I get over Bork? No, I won’t. You should move to the Balkans where they have made an art form out of nursing stale grudges concerning things past in place of a forward looking politics. You can’t just leave that analysis there without acknowledging that the democrats have used identity politics, fear, and outright betrayal of their former base, the working class of every race to create an elitist party that has actually tried to replace the electorate they had. They are nothing like Tip O’Neals party and there excesses led them to nominate Hillary and even cheat Bernie to make sure she got the nomination. Come on, quit attacking the Republicans without facing up to the hot mess the Democrats have become. The really sad thing is the lock these two destructive parties have on our system. I would agree to everything you just said above. there is cynical venality that exists on both sides of the aisle. In addition, both sides play on social issues while at the same time allowing wealthy interests to go through our wallets. Our nation’s infrastructure is crumbling before our eyes. Education, Health, the vital organs of state that we all depend on, are all also crumbling, and not being taken care of. Most of us – no matter the political affiliation – are good decent people that just want things cleaned up. Washington DC is a screaming venal mess, and of no help. Maybe we should all just start a new capitol in Kansas or somewhere, let states join in if they want to or not, and then go from there. Re: But opposition to a potential justice on ideological grounds when the justice holds extremist views (yes, Bork did!) is completely appropriate. If Bork held such extremist views, then why was he unanimously confirmed to the DC Circuit Court of Appeals? Why did the Supreme Court find his work on anti-trust law so influential? Why was he in the majority in 95% of his three-judge panels while on the D.C. Circuit Court? Why didn’t the Supreme Court reverse a single one of the majority opinions he wrote or joined? Do you actually have any evidence for your charge of extremism, or are you just mindlessly repeating talking points from some lefty website? Democrats accused of him of holding hostile views of minorities, grossly distorting his record in the process (he had ruled in favor of minority plaintiffs in seven of the eight cases that he presided over as judge). They floated rumors that he was a drunk and a tax cheat and that his wife was a Holocaust denier. They personally and professionally threatened two potential black witnesses called to testify in favor of Bork. Both cancelled their testimony. Re: But in fact Bork really did hold a non-exaggerated version of the views attributed to him. He gave us “Slouching Toward Gomorrah” as evidence, and other tidbits as well. Did you want to cite anything from that book or those other “tidbits” to back up your accusations? And spare me the nonsense that Republicans were just as bad. They did not retaliate against Clinton’s nominees after their own nominees were viciously smeared (let’s not forget the Democrats’ racist smear campaign against Clarence Thomas). They overwhelmingly voted to confirm Ruth Bader Ginsburg and Stephen Breyer, and managed to do so without smearing either one of them. So your point that what happened to Bork was “just politics” is dead wrong. It was the Democratic Party that turned judicial hearings into an acrimonious ideological war. That’s why they smeared Bork and Thomas, because they depend on the Courts so much to impose their agenda on the electorate. Deflect all you want with ludicrous accusations of Bork’s extremism. Just don’t expect anyone to be persuaded.